Touchstones – Using Touchstones is consciously building positive patterns. You are drawn to your touchstone because it speaks to you in your personal symbolism. It is your anchor. It is a reminder to notice opportunities and be an active participant in the present moment. Rectangular shape touchstone was designed as a window. Touchstones are the window of opportunity you give yourself to claim your own direction. Triangular shape touchstone was designed and later called a shield. A shield is used to notice and release negative energy and create a space of safety. The necklace shape touchstone - I was reluctant to make a touchstone pendent. Jewelry has often been used as a talisman. Touchstones are not about a piece with power. They are about you and using touchstones as reminders. 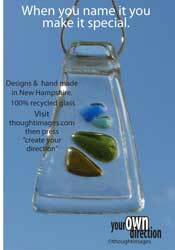 Custom design touchstones – Touchstones are personal expression of direction. You are drawn to your touchstone. It speaks to you in your own personal symbolism. So why not design your own touchstone? 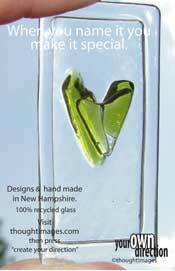 Here are a few examples of custom reminder pieces in recycled glass. If this direction appeals to you just follow the steps and you can be the designer of your own touchstone. Inner Space Sanctuary Pieces - It is a reminder that your calming, healing space is always within and available. 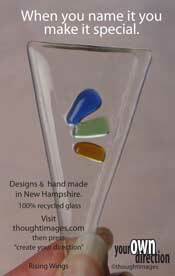 This series of touchstones is made in treated cloth and glass. It’s was designed with an opening or empty space within. This space is your sanctuary your own inner space. 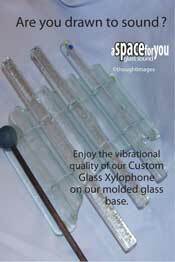 The Sound of Glass - Generating sound is actively engaging in the producing of vibrations. You are consciously changing the flow of the energy. You are clearing resistance and feeling the movement of air. It is an act of joy to connect with the healing sounds of music. 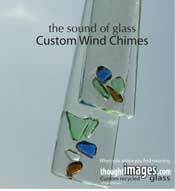 Using my custom glass xylophones and wind chimes is a harmonious way to notice and clear space. Touchstones with a smile – Here is where you will find my illustrated group of characters. They are drawn without eyes, nose or ears. They remember your value and want you to embrace your joy and thrive. These simple and powerful illustrations are reminders or touchstones that are connected to action and a positive connection to thinking and words. 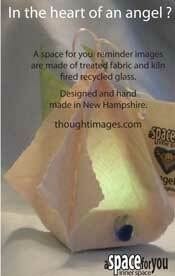 Thought Images gallery is about noticing and valuing your “super self”. Thank you for visit the gallery. Now is the chance to discover recycled glass and cloth pieces to serve as touchstones, anchors and reminder pieces with sound. Noticing is the greatest gift for positive change you can give yourself. You are full of possibilities to thrive. You can choose to see value and grow. You can see resistance and use them as jumping off point to greatness. You can notice the ease and open the healing flow of abundance. It is all about noticing value. It is all about supporting a direction of thriving. It is all about growing beyond the possibilities that you can believe are possible today and moving to a greater range of possibilities. It’s about noticing the joy, the ease, the patterns and the gifts along the way. It’s all about taking charge and connection to and believing in our core wisdom. It is about liking who you are and stretching to find more opportunities to like yourself. It is about moving past blame and judgments to a sanctuary beyond contrast. It is not about that others think. It is about your thoughts and how you build your life from the seeds of thoughts you sew and the ecco of sounds that reinforce your vibrations. Dear Friend, Welcome to my gallery. This is a new stage in my quest to find joy in the journey. This web site started with a thought that needed to be voiced. Words I noticed are smaller than the robust nature of thought. I explored thought with images. The images reformed into vibrations. I started to think about light (color) and sound.